Wednesday, March 29 at 7 - 9pm at Shoreline Community College, Map, 16101 Greenwood Ave N, Shoreline 98133. Recent research has shown that children have very complex understandings of differences and stereotypes. Far from being color-blind, most children are aware of how their own skin color is an advantage or disadvantage. They also judge their peers based on stereotypes that adults might like to believe they are unaware of. Because of this, it is important to give children anti-bias messages, through actions and words, to actively counter what they are witnessing in the world. Ilsa Govan, M.A. is a co-founder of Cultures Connecting. She has more than fifteen years of experience as a classroom teacher and anti-racist community activist. Ilsa worked as an Equity and Race Specialist for Seattle Public Schools, addressing institutional racism in a large organization. 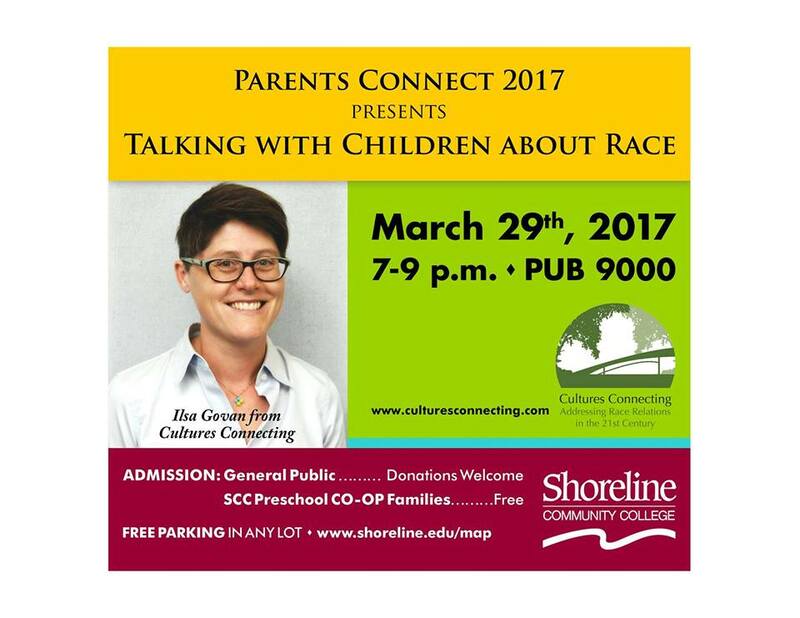 She has also served on the planning teams of the Seattle Race Conference and the White Privilege Conference. Ilsa earned her Bachelor’s Degree in Special Education from Western Washington University and her Master’s Degree in Bicultural Human Development from Pacific Oaks College Northwest. Donations accepted at door - courtesy registration requested.